Waiting for acne to clear on its own can be frustrating. It can also lead to permanent scarring, poor self-image, depression and anxiety. To avoid these physical and emotional scars, dermatologists recommend that acne be properly treated. Sublative RF is a non-laser and non-light-based treatment, a technology in which thousands of microscopic energy columns treat a fraction of the skin at a time without affecting the surrounding tissue. RF sublation — fractionated bipolar radio frequency technology — is used in Sublative Rejuvenation to place heat energy effectively into the dermis, where it can produce significant dermal (deeper skin) impact with minimal epidermal (superficial skin) disruption. Sublative RF keeps the majority of the top layer of the skin intact, delivering bulk dermal heating beneath the skin to maximize collagen production. 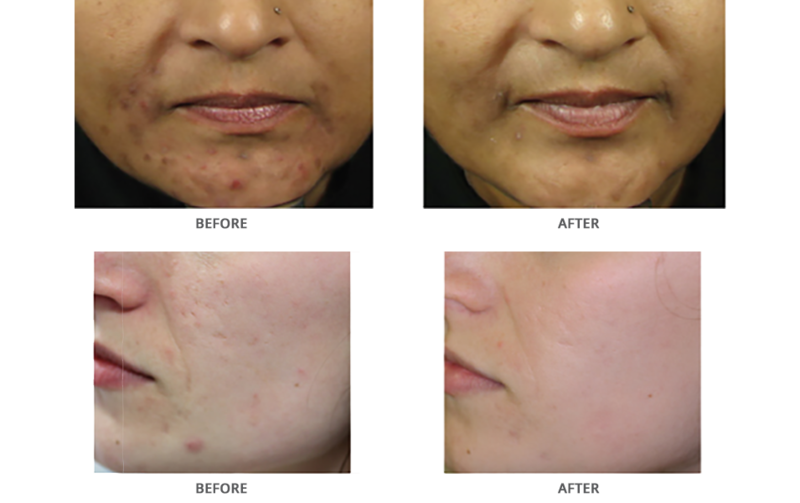 This treatment resurfaces your skin by replacing damaged tissue with younger, tighter, smoother, healthier skin. A minimum of three treatments every four to six weeks is typically recommended. Results are immediate and progressive, with optimal improvement usually visible in six to 12 months. This time frame and treatment structure allow for complete healing and the production of new collagen and elastin to replace damaged tissue. Maintenance treatments are recommended yearly to maintain and further enhance results. Swelling and redness are the most common side effects. Other temporary side effects may include minor itching, dry skin, peeling or flaking, and a bronzed-skin appearance. Your Brinton Lake Dermatology doctor will provide instructions about what to expect and how to minimize any side effects. Fraxel laser treatment targets aging and sun-damaged skin with microscopic laser columns that penetrate deep into your skin to expedite your body’s remodeling of collagen. The laser treatment resurfaces your skin by replacing damaged tissue with younger, smoother, healthier skin. And since the laser treats only a fraction of tissue at a time, it leaves the surrounding tissue intact, which promotes very rapid healing. On average, an effective treatment regimen is three to five sessions spaced about three to four weeks apart. Results are immediate and progressive, with optimal improvement usually visible in two to three months. This time frame and treatment structure allow for complete healing and the production of new collagen and elastin to replace damaged tissue. Swelling and redness are the most common side effects from Fraxel treatment. Any redness and swelling is typically minimal and subsides within a few days. Other temporary side effects may include minor itching, dry skin, peeling or flaking, and a bronzed skin appearance. There is a limited risk of infection, hyperpigmentation or scarring. For additional information, you may visit the Fraxel website. Bellafill is a smooth, collagen-based filler. It’s FDA-approved for correction of nasolabial folds and moderate-to-severe, atrophic, and distensible facial acne scars on the cheek. It’s considered a semi-permanent filler, so your positive results will last for years. Injections are simple, in-office treatments with no downtime. Once injected into the acne scars, the collagen gel provides immediate volume and lift. Over time, the collagen is absorbed by the body leaving the polymethylmethacrylate (PMMA) microsphere beads in place. These microsphere beads (half the diameter of a human hair) create a scaffolding which supports the body’s own collagen for lasting correction. Temporary swelling, redness, pain, bruising, lumps/bumps, itching and discoloration at the treatment site could occur but typically resolve within a week.